Steel, first used almost 4,000 years ago, is a combination of iron and carbon. Modern-day steel, including the stainless steel found in hospitals, is an alloy of those same two elements, plus others to increase strength, reduce corrosion, or produce other beneficial attributes. In hospitals, stainless steel can be found in operating room trays, hallway grab bars, kitchen work surfaces, and throughout the building in door handles, sinks, shelves, and racks. It is a very hard surface that stands up to heavy use and variations in temperature without breaking. It is also non-porous, so liquids do not seep into the surface to create stains or corrosion. In terms of costs, stainless steel is also quite affordable. However, stainless steel does scratch easily and develops a more matte look from all the layers of scratches. These scratches can harbor bacteria if not cleaned properly. First invented as a thermal insulator, laminate surfaces are one of the most affordable, and therefore most prevalent surfaces found in institutional settings including hospitals. In essence, a laminate surface is made of layers of compressed paper and resin (a liquid glue that hardens with treatment) over a thicker layer of glued brown Kraft paper (think paper bags). All the layers are heated together to bond into a single thickness that can then be used in horizontal and vertical applications (but not molded) over a wooden substrate.Laminate surfaces are so incredibly popular because they are cheap and come in a virtually limitless array of colors and patterns. In a hospital, however, these benefits are quickly outpaced by the costs: Laminate breaks down under heavy use, revealing paper core at corners and seams, and it does not hold up in high-moisture environments. Laminate provides a cheaper but short-lived product that can harbor bacteria. A "solid surface" is a man-made material composed of a resin (most likely acrylic or polyester) with pigments and stone dust. Because the majority of the ingredients are plastic, solid surfaces can be shaped using heat (thermaformed). Solid surfaces can be found in most newly-constructed or renovated hospitals and healthcare facilities as counters, tables, desks, workstations, and sinks. 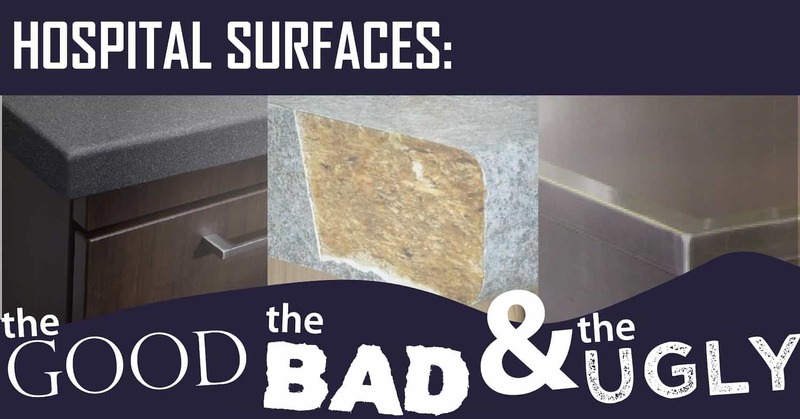 The benefits of a solid surface are its resistance to stains, its seamless construction that provides fewer cracks to harbor bacteria, and it ability to be repaired. Nonetheless, bacteria continue to grow on these surfaces in between cleanings. As for cost, solid surfaces are typically on the higher end of materials, at times even equal to granite. While the seamless appearance of a solid surface provides fewer places for bacteria to survive, bacteria present will continue to reproduce on its surface between cleanings. Like solid surfaces, engineered stone surfaces are made from a combination of stone (usually quartz or marble) and a polymer resin. In the case of engineered stone, however, the stone ingredients constitute a greater proportion of its composition. The result is a more stone-like appearance that cannot be thermoformed. Engineered stone, also known as quartz, can be found in reception areas of healthcare settings, guest bathrooms, and in other locations where decorative surfaces are needed. Engineered stone would be considered a luxury choice when it came to a hospital budget, and it can harbor bacteria if not cleaned properly. The tile found in many hospital operating rooms, bathrooms, kitchens and wash rooms is typically ceramic or porcelain. Individual tiles are adhered to a substrate using grout (a cement-based glue and filler). This ubiquitous floor- and wall-covering is affordable and durable. Because each tile is separate, tile surfaces provide ample crevices for bacteria and mold; the grout provides additional surfaces that can be difficult to clean completely. Known popularly as linoleum (considered the first brand name to become synonymous with an entire product category), vinyl surfaces are found throughout hospitals, especially in flooring. Polyvinyl chloride, or PVC, is the newest formulation of this surface. This layered material can be installed in large, uninterrupted sheets, as tiles, or as die-cut patterns to allow for decorative designs or wayfinding guides (blue lines leading to a specific department, for example.) PVC is low-cost and durable, but requires regular upkeep including buffing and waxing. Commercial carpet is typically made from twisted or tufted polymer fibers attached to a backing. The most common carpeting found in healthcare facilities is installed as carpet tiles, small sections of tightly packed fibers that can be replaced easily. To maintain durability and safety, commercial carpeting must have a water barrier in the backing to prevent moisture from collecting under the carpet and leading to dangerous mold, mildew, or bacteria growth. Carpets require much more intensive processes to keep them hygienic; as a result, carpets are typically found only in reception and guest areas, and in some cases, hallways. One of the important benefits of carpet is that is muffles sound, an important element in evidence-based design. A new option available to hospitals today are surfaces that actively kill harmful bacteria. These include sheets of raw copper alloys or EOScu, an engineered surface containing suspended cuprous oxide. Both surfaces are EPA-Registered for Public Health Claims, meaning they have been third-party tested for their biocidal efficacy. Copper alloys can be shaped and molded for a variety of uses and provides a metallic surface much like stainless steel. EOScu can be fabricated in sheets (such as for countertops) or injection molded into bedrails or other rounded surfaces and provides a surface much like engineered stone. These hard surfaces represent the range of choices for hospital designers and administrators. When balancing cost, appearance, safety, and durability, those making design decisions have a long-term impact on the hospital. With the addition of biocidal surfaces, these designers can even have an impact on the health of patients. To learn more about how hospital surfaces compare across four main categories, please click below.